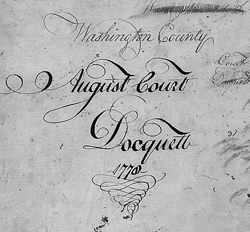 The Court Records of Washington County Maryland included here cover the years from 1778 to 1793, although many of the court records are not available. Courts were held three or four times a year, usually in March, August and November. Much of the language of the courts in the 1790s seems unlike modern legal procedures: recognizances respited, criminal writs, appeals under militia law, imparlances, judicials and references, to name a few. The Legal glossary may provide some guidance. Some of the charges are unfamiliar as well: "neglect of his duty as overseer in Marsh Hundred", bastardy. But many of the issues that the courts dealt with are common today: selling liquor without a license, breaking the peace, slander, theft, assault, assault and battery, trespass and debt. While legal scholars may find these records of interest, those looking for early history of Washington County will discover many stories here. Chapline, Swearingen, Cresap, Ringgold, Newcomer, Funk, Rochester are all here, in cases of equity (involving petitions to sell land), or called as witnesses or for any of the myriad reasons the courts would have listed their names. Also in this collection are several pages from a Boat Lien docket dealing with events 1874 to 1888. The boats, presumbly canal boats, are named as are the owners and the liens attached to the boats. In addition there is correspondence and notes concerning the boats. We have not attempted to transcribe all of the court records, given the complexity of the terminology and the difficulty of reading the text. Instead this collection is our best effort at reading the names of the persons listed on the Washington County Court records from 1778-1793, and some boat lien records from 1874 to 1888. These records are stored at the Maryland State Archives and copies of the images can be found at County Records, Washington County Court, 1778-1800, Maryland State Archives. The Riggs Conard Trust Fund supported the indexing of these records. The documents were indexed by Marsha Fuller, CG. Western Maryland Regional Library is grateful to Dennis Weaver, Clerk of the Circuit Court of Washington County, Maryland for partnering with them to make these materials available to the public, and to the Maryland State Archives for digitizing them.